“TE” Web sling made with a loop eye on each end that is a at a right angle to the plane of the sling body. This type of sling is commonly referred to as a “twisted eye” sling. 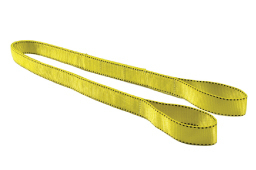 This sling is suitable for all hitches, but is recommended particularly for choker hitch application. 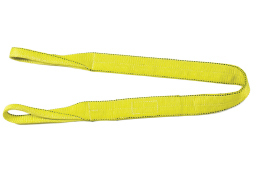 “EN” Web slings are a continuous loop formed by joining ends of the webbing together with a load-bearing splice. They are extremely versatile as the design allows for rotation of bearing points, avoiding one constant bearing point and thereby increasing useful life. They are suitable for use with all three hitches: vertical, basket and choker.